I am starting a new series where each Thursday I will try out a new clean eating recipe that I find online and share with you all how it is. 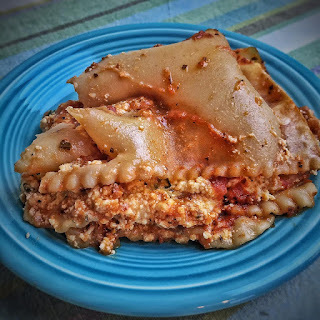 I decided to go back to my Italian roots for this first recipe and try out a vegan lasagna. This particular recipe which I got over at Hummusapien was easy to make, dairy-free, and absolutely delicious! I give this one two thumbs up! Highly recommended! In the meantime, in a large bowl crumble tofu with your hands until it resembles the texture of ricotta cheese. Add hummus, nutritional yeast, spinach, garlic, salt, and basil. Using your hands, mix ingredients together until it becomes a creamy ricotta-like texture. In a baking dish pour enough sauce to cover the bottom of the dish. Layer lasagna noodles on top (amount of noodles depends on pan size). Top the noodles with enough "cheese" mixture to cover evenly. Top cheese mixture with more sauce, then noodles again, then more cheese mixture. Top cheese mixture with the rest of the sauce.